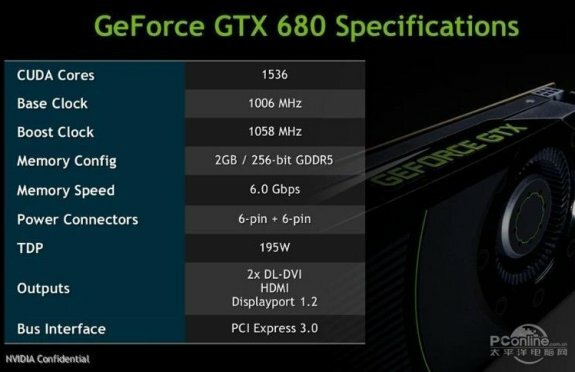 More leak about the next generation graphic cards from Nvidia based on the 22nm with "Kepler" GPU codename, this time it's a a slide show specifications of the Geforce GTX 680 card spotted at an Asian tech site PCOnline.com.cn. The slide show 1536 CUDA cores as expected and an initial core clock that pass the Ghz running at 1006MHz, and the boost clock is at 1058Mhz, a new feature here in the house that will make everything dynamic on your computer from the CPU clock to the GPU clock, wish that will help to make more green things, lets continue, 256-bit memory bus is confirmed too, 2GB GDDR5 running @ 6000MHz, the card require two 6-pin and 195W TDP. Update: More unofficial specification spotted about the next Geforce 600 series at gpureview. GTX 680 Vs HD7970 Vs HD 7950 first benchmarks ? GeForce 680 card GK104 based picture? AMD Tenerife HD 7980/7990 graphic card details ?